A busy crafter sometimes makes a bad blogger and I am seriously guilty on both counts! It’s been a mad run up to the holidays but I’m delighted to have nearly finished all the little projects I have started and to have two seconds to share some of the details here! Most of these are homemade Christmas sweets and gifts -including cards, tags, fudge, toffees and mints. Yum! I did a pick-and-mix approach to cards this year making some for close family and friends and relying on nice shop ones for those that needed earlier posting. 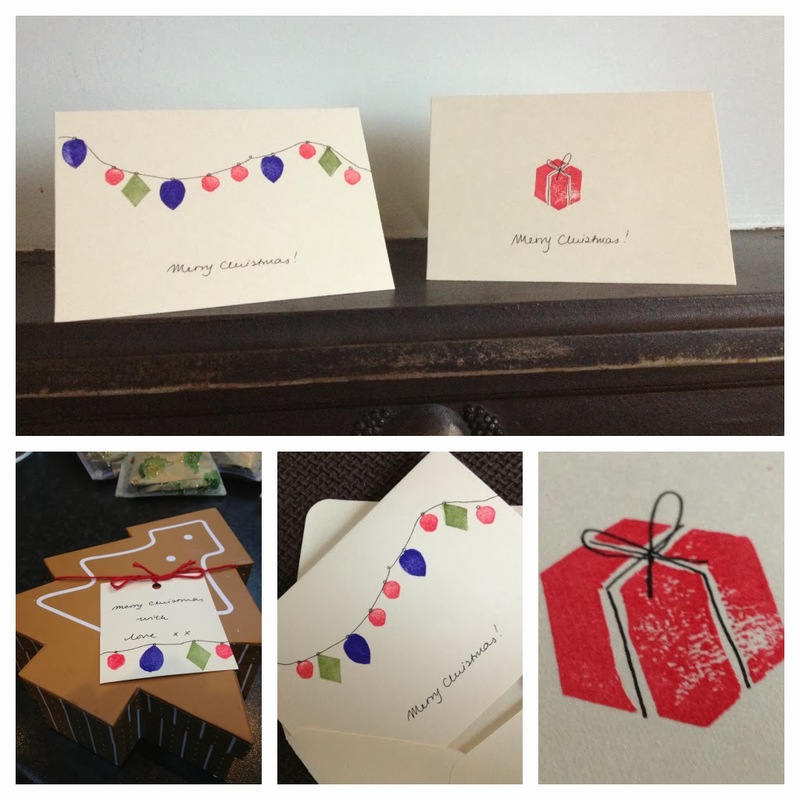 My little stamps came in handy and I love the simplicity of the handmade ones….complete with slightly wonky bits! I made up some nice boxes of sweets for the girls in our kid’s creche. 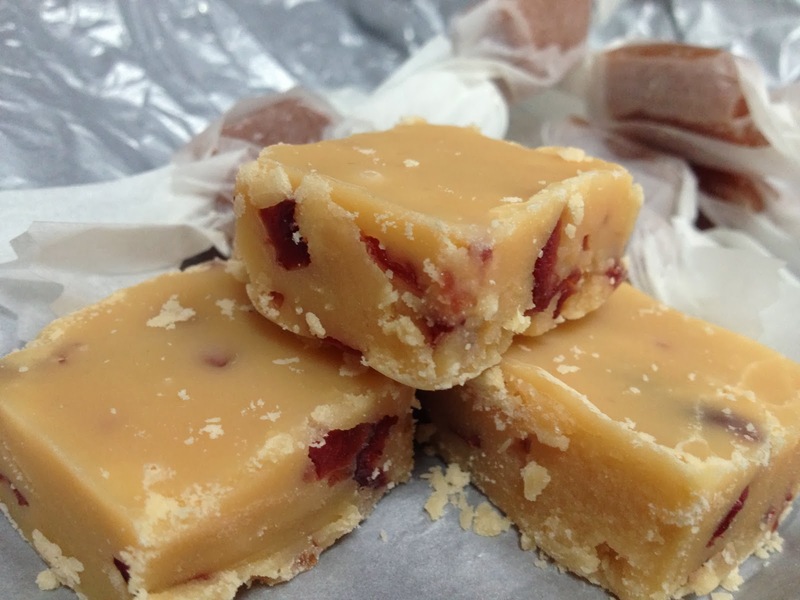 I made a mixture of fudge – cranberry and vanilla and plain vanilla; coconut caramels; and peppermint bites. These are seriously sugary but a nice treat. I packaged them up in some cute Christmas boxes and little favour bags and they look very cute! Being honest I made these without having a candy thermometer but I could have made it easier on myself by just getting one as it was a bit stressful making sure the sugar syrups didn’t burn! It’s certainly a job for when the kids are busily occupied elsewhere! This is a recipe from Lisa Faulkner’s lovely Recipes from My Mother for My Daughter. I made my first batch as plain vanilla and for the second added cranberries. You can add almonds also but I didn’t have any that day! I use caster sugar rather than plain granulated as I find it gives the fudge a nicer texture. Makes about 50 individual sweets. 1. Line a 20cm square cake tin and grease with butter. 2. Put the condensed milk, sugar, water, butter and vanilla extract / seeds into a heavy-based saucepan. Cook over a low heat for about 10 minutes, stirring constantly, until the sugar is dissolved. 3. When the sugar is dissolved, turn the heat up to medium-high and boil for 7 to 10 minutes, stirring occassionally. The mixture bubbles away but make sure you don’t let it burn. After 7 minutes, drop a small teaspoon of the mixture in a glass of cold water. If it forms a soft roll-able ball between your fingers and thumbs it’s ready. If not, give it a another minute or two and try again. Remove from the heat and set aside for a few minutes. Here’s a picture of how mine looked as it bubbled away and started to caramelise with the colour changing to a lovely golden colour. 4. If adding, tip the almonds and cranberries into the mix. Beat the mixture well for a minute or two. Pour into the tin and leave to set for a few hours. 5. Cut into small bite sized pieces, oiling the knife to prevent it sticking. I tried a few variations on recipes I found and this worked out well – and fairly easy. I had to do some tweaking on the ingredients but here’s the one that worked for me. 1. Line the bottom and sides of a 1lb bread loaf tin with parchment and brush with coconut oil. 2. Combine the coconut milk, golden syrup and sea salt in a heavy bottomed saucepan. Heat over medium low, stirring constantly for 2-3 minutes until mixture is just warm and any coconut milk clumps are dissolved. Remove from heat and set aside. 3. In a clean saucepan,combine the sugar and the water and stir to mix. Place over medium high heat and let cook, without stirring, till the sugar turns a light amber color and a candy thermometer (if you have one!) reads 310°F. Immediately remove from heat and pour melted sugar into the coconut milk mixture- being careful as it will bubble and may splash. 4. Return to medium low heat, stirring continuously until all the caramel is dissolved. 5. Raise the heat to medium high, stir continuously, and cook until caramel becomes quite thick and a candy thermometer reads 240°F. Again if you don’thave a thermometer you can drop a teaspoon full of the caramel in a glass of cold water and if it goes ‘chewy solid’ its ready to go. Immediately remove from heat and pour into the prepared tin. ** the first time I did this I was rushing out the door when the caramel was thickening and ‘may’ have rushed the process a bit, so the caramel I poured into the tin didn’t set. When I noticed – a few hours later, I just poured it back into a clean saucepan and brought it back to the boil for a bit longer and sure enough that did the trick and it thickned up properly and set just fine. Maybe not the most recommended way to get there but good to know there’s some comeback if you undercook it! 6. Let the caramel cool and cut into 1″ squares. Brush your knife with melted coconut oil between cutting to avoid sticking. I found cutting up the caramels was hard work – which made me a little worried that eating them would be a bit of an endurance test too, so I made the pieces extra small. Less a gobstopper effect I hope! 7. Wrap individually in wax paper squares – I used plain greaseproof / silicone paper, cut into rectangles (c. 6cm x 5cm) that I cut using my shearing scissors for a prettier effect. Store at room temperature. 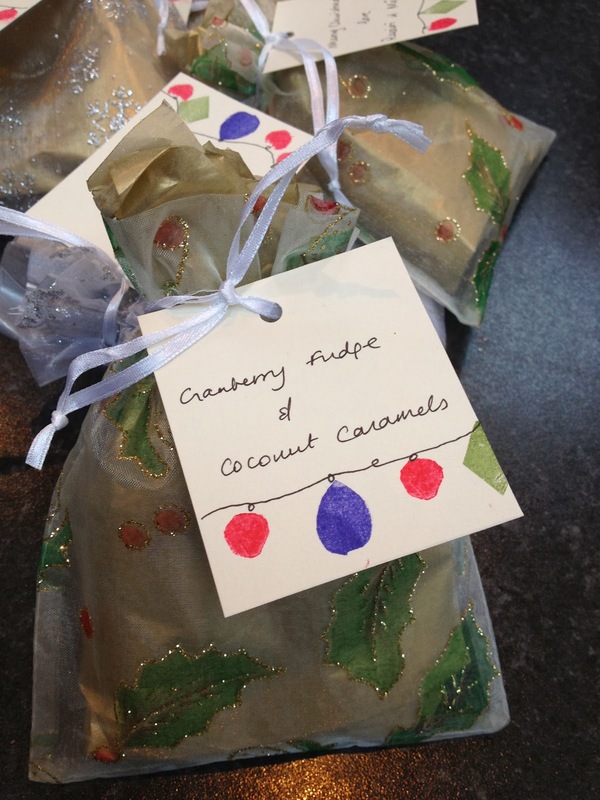 Another treat from Lisa Faulkner, these will be really nice after dinner on Christmas Day. Although maybe I’ll eat a few in the meantime…. 1. Sieve the icing sugar into a large bowl. Add the egg white and mix to form a soft, pliable mixture. Add the lemon juice a little at a time, making sure the mixture can be worked and doesn’t get too moist. Add the peppermint extract and food colouring, if using. Stir in well. 2. Cover a board / surface with icing sugar and turn out the mixture. Break off small pieces and gently roll into balls c. 2cm in diameter. Place on a greaseproof lined baking sheet and, using the back of a desert spoon, flatten each ball to give a smooth round shape. 3. Allow these to sit for a few hours before melting the chocolate and dipping each piece in melted chocolate to coat half of each bite. I will be trying the peppermint recipe for sure!